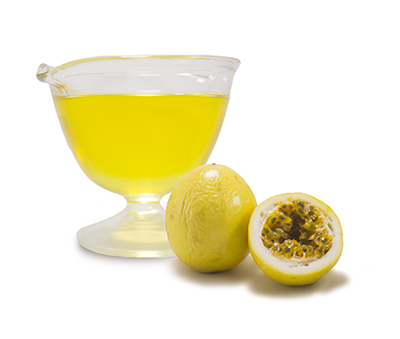 Cold pressed oil obtained from the seeds of the Passion fruit. The oil contains 70% of linoleic acid (Omega 6) and 15% of oleic acid (Omega 9), with a hint of a fruity fragrance. Due to its light fruity flavor, it is ideal to be consumed directly or with salads and cooked vegetables. Also it can be used as an ingredient for different blends and dressings. For personal care formulations in bath and massage oils, body lotions, sunscreen products, moisturizing creams, soaps and skin balms. Helps support healthy blood pressure and cholesterol levels within a normal range, and improves immune function. Because it is high in linoleic acid (Omega 6), it has regenerative properties and is ideal for use on stressed, irritated skin. This oil has antibacterial, antioxidant, smoothing, moisturizing and regulating properties. This oil is light and non-greasy, making it easily absorbed and won’t clog your skin.